No truer words were said...Birds of a Feather Flock Together. Yes, We Do! I photographed this tablescape yesterday morning and after lunch I was planting in the garden. I don't usually plant annuals, but this year because of the garden tour I'm planting of instant color. March is a busy month at My Cozy Corner. On Sunday we had a family dinner for Sweetheart. He is now 72 years old. Between birthdays and garden I'm one busy old lady. This jeweled napkin ring caught my eye at the thrift store about a month ago. I didn't by them at that time. $2.00 silly me. Then I was thinking they would look nice with this table. I hopped in the car and ran over to the thrift store. I couldn't find them anywhere. Finally I asked and there they were just waiting for me to bring them home. I love birds. When we first moved into our home the back yard was very different looking. HERE We had chickens and loved the fresh eggs each morning for breakfast while the children were growing up. Oh yes, our middle son will be 50 this Sunday. We're going out to dinner and celebrate our Patrick's birthday. He was born the day before St. Patrick's Day. What was I going to do. I had to name him Patrick. Besides I love the name. Well I sure did get off the topic of tablescaping. I.ve always been a a storyteller about everything. I try to stay as close to the truth as possible These plates have a story too. I don't know what plants they are, but they look like weeds to me. I found the four plates at a yard sale for $2.00. I knew they would be perfect for a spring table. I was going to use them later this spring outside under the pergola, but I just couldn't wait. The place mats were on clearance at TM. There is a set of place mats, four napkins and a table runner for $9.00. I didn't use the napkins for this tablescape because they are huge. I had this smaller contrasting green napkin that works well with my semi-shear napkins. The white flatware is from Walmart. Have a great weekend and hopefully we will all have a sunny Sunday. 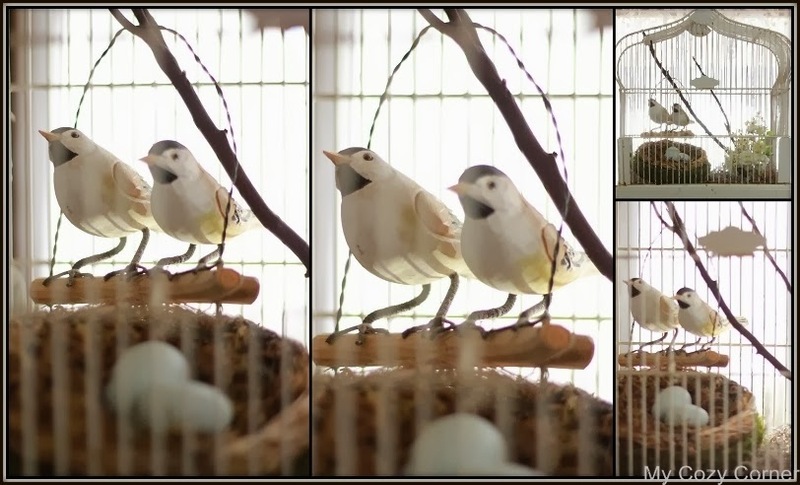 Love the bird cage, it;s a keeper and the birds look very good in there. I love your dishes, especially the weed plates as you call them. Who made them? Very Spring tablescape. Happy Bday to your Mr and have a wonderful St. Patrick's Day. Thanks for your comment. The weed plates have nothing on the back. Thanks for the birthday wishes. Lovely! The plates are beautiful and the bird touches are wonderful. I thought the birds were real at first! I love the table with your sparkly napkin rings and weedish plates. The touches of yellow are so Springy! Thanks for sharing at Fridays Unfolded! and didn't you have a happy St. Patrick's Day those years ago and everyone since ! Love, Love, Love the bird cage! I love birds, too. Lovely table setting. Perfect for Spring. Have fun celebrating your son's B-day. It's the big one. Hope you will pop over for a visit. Wonderful tablescape.....Love the plates and the birdcage! Hi Betty, I love how you put all this together to make such a fresh spring time table setting. I wanted to let you know that I featured this post on Inspired Sunday at www.sundayview.blogspot.com. I love your tea setting and your china is gorgeous. I have a 'thing' for bird cages and bird houses so I am loving yours! Your little birdies are looking right at home in there. Your table settings are wonderful and they pull in all the green for St. Patricks day and springtime. I like your use of the grapevine too. Thank you for coming to tea and Happy Birthday to your hubby and your son! What a wonderful table! I love the birdhouse and sweet birds. And your plates are wonderful! They remind me of Portmeirion. So pretty and a perfect birthday setting! Thanks so much for linking to Tuesday Cuppa Tea! Birds - birds - birds! Lovely! Wht a fun posting! Your table is lovely. Even the Dandelion plate. Actually it is a VERY pretty plate! Such a pretty spring tablescape! Love the birds! It's not often you'll see a china plate with dandelions on it, but it is lovely, and I see clover as well - a good find! You're a gifted thrifty shopper. I lost a LONG comment. It was great, Betty. I will be back if I can. Your birdies are just oh so sweet, and I love those wonderful plates!